Images and tattoo artwork involved in the images above are property of Scapegoat Tattoo located in Portland, OR. Scapegoat Tattoo, a tattoo studio located in Portland, OR. 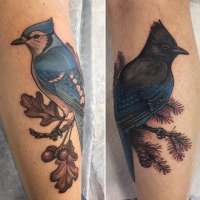 The studio's staff includes tattoo artists such as @shawn_hebrank, @ryanscapegoat, @ryancooperthompson, @sillysilje, and @the_noble_mountain. The studio has a 4.7/5 combined rating from 226 reviews. This rating is a combined value of the studio's Facebook Page and Google Places Page. Images are property of Scapegoat Tattoo located in Portland, OR. This studios listing information was last updated 7 months ago. Fantastic place. Nice staff. Talented artists, especially Shawn Hebrank! Can't wait to go back! Very nice staff. Worked with us so my partner could get a tattoo on our vacation as a walk-in. Reasonable prices.